The idea is to provide a safer emergency alternative to street drugs that may be cut with deadly doses of fentanyl. Among their many differences, Canada and the United States share a common crisis: opioid overdoses. Drug overdoses are the leading cause of accidental death in the United States, killing more people than the AIDS epidemic at its peak. More than 42,000 Americans died of opioid-related causes in 2016, and the crisis shows no signs of receding. Canada, too, is in the grip of an opioid overdose epidemic, but public health officials in the province of British Columbia – which is projected to account for nearly one-third of overdose deaths in the country in 2017 – are hoping to prevent a surge in deaths with a novel approach: a vending machine that distributes prescription opioids to addicts. The B.C. Center for Disease Control (BCCDC) announced last month that it plans to install three vending machines this spring that will dispense hydromorphone pills, a powerful prescription opioid, to people with a high risk of overdose. A landmark study in 2016 found the painkiller to be an effective opioid replacement therapy, and experts say it could also reduce dependencies on contaminated street drugs cut with lethal substances such as fentanyl. A $1 million grant from Health Canada will help to fund the project, which officials say could be expanded as early as this summer after its launch in the spring. At least 1,460 people died of an opioid-related overdose in Canada in the first half of 2017, a figure that Canada’s public health agency projects will surpass 4,000 once data is reported for the rest of the year. British Columbia declared a public health emergency in 2016. More than 1,208 people died of opioid overdoses from January to October 2017, according to the B.C. Coroners Service. Fentanyl, a synthetic opioid that is up to 100 times more powerful than morphine, was detected in 83 percent of overdose deaths in British Columbia. It is increasingly being used to cut street drugs such as cocaine and heroin – sometimes surreptitiously – dramatically boosting their potency, with often deadly consequences. Death rates from drug overdoses in British Columbia are almost as high as those in the states hardest-hit by the opioid epidemic in the United States. In British Columbia, the drug overdose death rate was 30.2 deaths per 100,000 people from January to October 2017. In Delaware and Rhode Island, it was 30.8 per 100,000 people in 2016, according to the Centers for Disease Control and Prevention. The severity of the crisis in British Columbia has pushed it to go further than the rest of the country in finding ways to reduce the harm done by drugs. 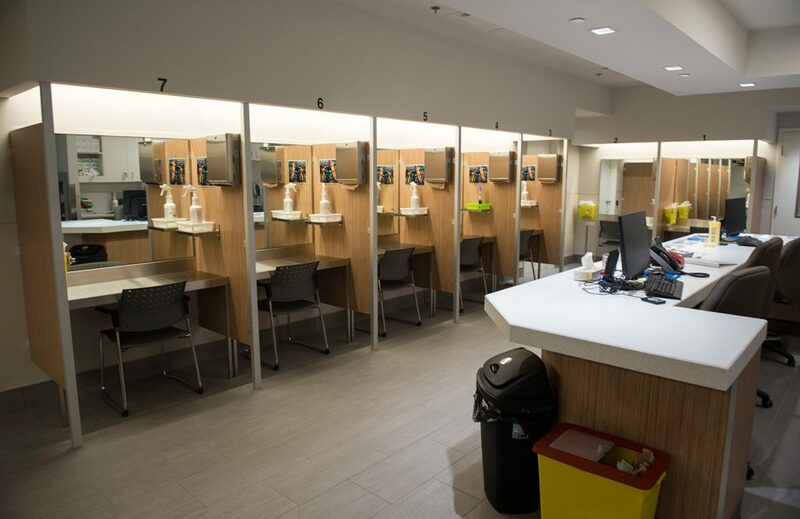 The province is home to eight supervised injection sites, where addicts ingest illegal drugs under the supervision of nurses who can intervene in case of an overdose. Since 2011, Vancouver’s Crosstown Clinic has offered injections of pharmaceutical-grade heroin to addicts for whom other therapies have been ineffective, and it recently began administering injectable hydromorphone for opioid addicts. But while these programs have been effective, officials say that their models are costly, difficult to scale and limited in their accessibility, particularly for those in remote communities. The vending machine project could solve those problems. Under the pilot project, drug users would be able to get two to three hydromorphone pills three times a day. Each tablet costs roughly 3 Canadian dollars per day – far less than the 25,000 Canadian dollars per person per year that it costs for the programs at the Crosstown Clinic. The machines are relatively inexpensive, making it easy to expand the program quickly. Vending machines have long been used as a harm-reduction tool. Syringe-dispensing vending machines have existed for decades in Puerto Rico, Europe and Australia to reduce the spread of HIV and hepatitis through injection drug use. Clark County, Nevada, and Ottawa, Ontario, started syringe-vending machine initiatives last year. Tyndall said those concerns are unfounded. A company with experience designing vending machines for cannabis – which also requires extra security – has created prototypes of opioid-dispensing machines. The units would be linked in real-time to monitors and accessed using biometrics. The small quantity of pills dispensed and severity of the users’ addiction make it unlikely that they would sell their pills, he said. And if they did, the pills would be safer than toxic street drugs. Spokespeople for the syringe-dispensing machine projects in Clark County and Ottawa report no instances of theft or vandalism. Clark County is already expanding its program with two new machines this year. Others have voiced concerns that the project’s focus on increasing the availability of clean drugs to addicts to counter the tainted street drug supply was misguided. Marilyn Gladu, a Conservative party lawmaker and the shadow minister for health, said efforts to deal with the crisis should center on preventing addiction and getting addicts into rehabilitation. The goal, Tyndall said, is to reduce the number of deaths from overdoses. “You cannot get someone into rehabilitation when they’re dead,” he said.